Magic Jinn arrives on Earth. Catch up with him in his amazing 3D world and put him to the test! Think of an animal… and he’ll guess it! Talk to him and answer his questions, he’ll understand every word. 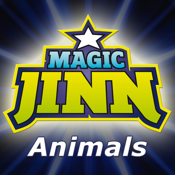 Get your Magic Jinn toy and connect it to the app to have even more fun! - Speech recognition: you don’t have to know how to read, Magic Jinn talks and understands what you tell him. - Voice commands: Ok, Yes, No, I don't know, It depends, Say it again, Go back. - Touch commands: for times when you want to play quietly. Note: You will need a microphone to use the speech recognition function.